Back in August, my wife and I took our two teenage sons to New York for eight days. I knew this was going to be a great trip to get some photos, so I took 3 cameras; one digital, and two film. The digital was a Canon 6D with 24-105mm f/4 lens. The two film cameras were my Leica M3 with 7Artisans f/1.1 lens, and a borrowed Olympus XA. I always tell myself I want to travel light and end up taking too much gear. The camera that received the most use on this trip was the Olympus XA. Why the Olympus XA? I needed something that was wider than 50mm, and small enough to fit in my pocket. The Olympus XA is a compact camera that was sold from 1979 to 1985 and has some not-so-compact features. It’s a rangefinder focus camera, aperture priority, with a 35mm Zuiko f/2.8 lens, and shutter speeds from 1 – 1/500th sec. The design of the XA is simple, you slide open the camera, uncovering the lens and activating the CdS exposure meter. The rangefinder focus is located below the lens, and the aperture is controlled by a vertical sliding switch on the front right-side of the camera. Compact 35mm cameras are commanding higher prices on eBay, and the XA is no exception. The unique compact design and sharp lens are two features that set this compact apart. The electronic A11 flash can be detached from the camera, making the camera a nice 7.9 ounces. And how did they get such a sharp f/2.8 lens in such a small design? According to Modern Photography Magazine in 1979, “high-refractive-index glasses had to be used to control aberrations across the picture field, and optical elements had to be manufactured and aligned to very close tolerances.” Olympus was able to accomplish this with, “the XA’s “reversed retrofocus” [is] a 6-element, 5-group optic measuring about 31mm from front element to film plane. Focusing is internal, via moving third group. Achieving this extremely flat design necessitated high index crown rear element, special flint second element. Result is a super-compact, rigid camera body with rangefinder focusing.” Voodoo magic and pixie dust? No, just some super engineering and meticulous optics. The size doesn’t predict the quality of images this camera can deliver. As you can see by the gallery below, the Olympus XA was used a lot on my trip. Unfortunately, the photos taken from the top of the Empire State Building and Rockefeller Center were subject to a few days of poor air quality in Manhattan. The only complaint I have about the XA is the sensitive shutter. The feather-touch shutter doesn’t take much pressure to fire, and it can take some getting used to. This is hard to explain, but this is the first film camera I’ve used where I knew immediately whether I got the shot I wanted. The images in the gallery were shot on both Kodak TMax 100 and Kodak Tri-X 400. This year will always remain memorable because my wife and I celebrated our 25th wedding anniversary by taking a 3-week trip to Europe. We went with a small group and visited Italy, Switzerland, and France. I took three cameras: Canon 6D, Pentax K1000, and Olypus OM-1MD. I spent most days taking digital shots, but used the two film cameras for early morning walks and evening adventures. Trying not to pack around too much gear each day, I’d swap one of the two film cameras in and out of my bag. Many people have asked us, “What was your favorite place to visit?” There’s no way possible to answer that question. From day-to-day we kept thinking, “Wow, today was fantastic! It can’t get any better than this.” Only to be surprised by the sights and experiences we’d have the very next day. I came to know Bailey when my wife and I took a trip last summer with a group to Europe. Bailey is a senior in high school and enjoys playing the piano, Harry Potter, boys, and photography. After returning from Europe, I emailed Bailey and asked if she wanted a film camera to try. She quickly replied with an enthusiastic, “Yes!” I gave Bailey the Olympus OM-1 MD that I took to Europe, provided a short tutorial, presented her with a manual, and a roll of Ilford HP5+ black and white film. A few weeks later, we met and shot the Kulture Krash Car Show in Clearfield, Utah. After the car show, I asked Bailey if she would be interested in developing her roll of film. Again, she gave me another enthusiastic, “Yes!” A few weeks passed, and she came over to the UTFP Worldwide Headquarters (my house). I showed her how to load a Patterson reel, and explained the chemistry we would be using. Since I needed my roll of film from the car show developed, I had Bailey develop mine at the same time. After the final rinse, she took her negatives off the reel to hang up, and her first response was, “Oh cool!” She experienced that feeling film photographers get when they see the final results of something physical they’ve created. Overall, she did fantastic and had a positive experience. Through a Q and A, I asked Bailey if she would share some of her thoughts. What camera and film did you use? My first ever film camera and the one I used on this shoot was the Olympus OM-1, with 400 ISO film. While you were shooting, did anyone ask you about the camera? This sweet little old man sparked up a conversation about my film camera, asking me what kind of camera it was and telling me about one of his old film cameras. What did you take photos of? All of the photos I took were of different cars at the car show in Clearfield, most of them focusing on the cars, but a few with people in them. What did you like about taking photos with a film camera? I loved being able to adjust the settings manually and seeing how it affected the photo; I know you can do this on DSLR cameras when put on the manual setting, but most of the time before shooting with my film camera, I just set my DSLR on automatic. Shooting with a film camera makes you adjust the settings and really get familiar with the mechanics of photography. What did you dislike about taking photos with a film camera? You really have to take your time with a film camera, making sure you get the exact shot you want, which can be a good thing and a bad thing. It makes you better at composing your photos, but there are also times when I like to take lots of photos of the same thing, from slightly different angles or different composures, and then just choose the one I liked later on the computer. Obviously, with a film camera, taking lots of photos of the same thing isn’t very practical as the film does cost a bit and you don’t want to have a roll of film all of the same thing. What was the easiest part about using this camera? The easiest part of using the Olympus OM-1 was probably the accessibility of all the settings. Anything I needed to adjust, I could do so with my left hand on the lens, twisting and turning as needed. Another thing that was very helpful was the light meter; I could see how I needed to adjust the settings in order to have optimal lighting. What was the hardest part about using this camera? The hardest part of using this camera was getting used to adjusting all the settings by hand and not just having it done for me automatically, but it was, as I said earlier a very rewarding experience to now know how to do that. What did you learn by taking photos with a film camera? I learned a lot about lighting, aperture, and how to adjust certain things to make my photos better. What did you think of the development process? The development process was actually a lot easier than I expected! I was able to load the film much quicker than I thought I would, and developing the photos themselves is really just a lot of pouring in chemicals and waiting. It was really cool to actually develop the photos, though, rather than just have them printed off. I loved doing it. Did you think anything was particularly hard or easy about the development process? The easiest part was definitely just pouring in the chemicals and dumping them out. Once I got the film loaded into the tank, it’s a super simple process from there on out. What advice would you give other teens about shooting and developing film? 1. Learning about aperture, shutter speed, ISO, and all that in my photography class at first seemed confusing, but actually applying while taking my photos made a lot more sense. Don’t be afraid to play around with the settings and try new things out, it really helps you understand how everything works more. 2. Try loading film in the light before you do the actual thing in the dark (obviously with a roll of film you aren’t going to use). It helps. 3. Find someone in the field of film photography to help you out with everything. Ask them questions, have them show you how to do things, etc. Learning things for yourself online is good, but having someone in person to teach you is all the better. You can see more of Bailey’s photography on her new website. With graduation and moving away to college, I hope Bailey continues to be creative whether it’s through her photography or music. Here are some of Bailey’s favorites from her first roll. Up until last fall I didn’t own a single Olympus camera. Not by choice. They just never seemed to come up on my camera radar as a need to have item. 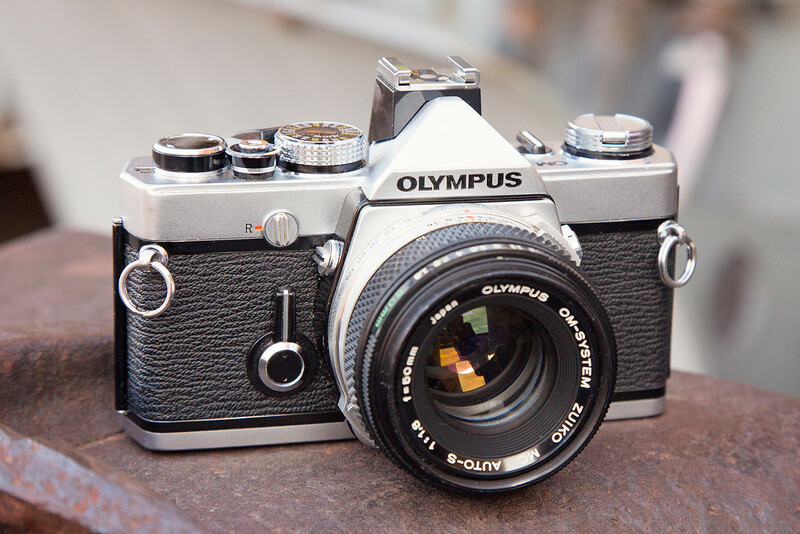 I found someone in the local online classifieds selling an Olympus OM-1 with 50mm lens for $100. The seller indicated she was searching for some other used gear, so I texted her with some items I was willing to trade. When we met and I inspected the OM-1, I found that the film rewind knob had been broken and a poor attempt to fix it was made. And worse, the shutter advance would move, but nothing moved inside the camera. I went ahead with the trade and took it to a local camera shop and learned that the repair was going to be more than the value of the camera. Kind of a disappointment, but with the attitude of nothing to lose, I decided to take it apart and see if there was anything obvious that I could identify as broken. I’m terrible with repairs. I barely know which end of a screwdriver I should be using. And my repairs generally involve a lot of cussing and frustration. This time I surprised myself and managed to get the film advance to work. I took the film rewind knob to my friend Maurice, who has far more patience and repair knowledge than I ever will. He had the knob back together with new parts in no time at all. After everything was working, I cleaned up the outside of the camera and replaced the light seals on the back. 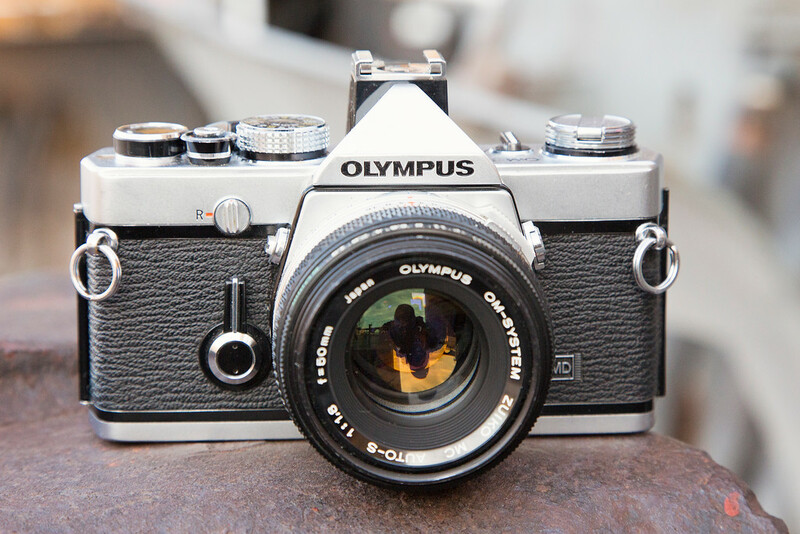 The Olympus OM-1 was released in 1972 as part of the new OM system. Like the Pentax K-1000 and Canon AE-1, the OM-1 has a large following. It’s an all mechanical camera with a full aperture TTL CdS exposure meter that’s represented by a needle visible in the viewfinder. And this camera has a big, bright, beautiful viewfinder. The viewfinder on the OM-1 has made it one of my favorites. It’s a solid camera body, but also compact and lightweight (675g). To me, the best feature on the OM-1 is where they placed the shutter speed and aperture settings, the lens! At first, this kind of threw me a curve-ball, but the more I use it, the more I like it. With the camera up to your eye, looking through the viewfinder, naturally your left hand is going to be on the lens for focus. Why not put both shutter speed and aperture settings on the lens? You see that you’re under or over exposed with the meter, so using your left hand that’s already on the lens barrel, you can quickly change your shutter speed or f-stop value. My OM-1 is currently paired with a fast 50mm f/1.6 Olympus Zukio lens. I’m glad I added the OM-1 to the UTFP fleet of cameras. It really is a fantastic SLR. The viewfinder is better than any Nikon, Canon or Pentax camera I have that was made during the same period. The lens is sharp. Moving the aperture control and shutter speed to the barrel was a brilliant move by Olympus. I like having the switch to the meter on top of the body so I don’t forget to power it off. One thing I don’t like on the OM-1 is the film advance. It has a long swing to it, maybe more so than other SLR’s made in the 1970’s. And if the film advance on this body had issues, it’s likely going to happen again. However, if another one came up in the local classifieds for the right price, I wouldn’t hesitate to get it as a backup or parts body. It’s probably a good point to note, though I refer to this camera as an OM-1, it’s really an OM-1 MD. Shortly after the OM-1 was manufactured in 1973, Olympus started to quickly add accessories and lenses for the OM System. One new accessory was a Motor Drive. The updated OM-1 MD had the necessary mounting holes in the bottom of the body where the OM-1 had none, this being the only key difference. These images were shot on Kodak Ektachrome 100 (Expired 2007). This is some of my favorite slide film and I’m looking forward to shooting some more Ektachrome in the OM-1 when Kodak re-releases it later this year!